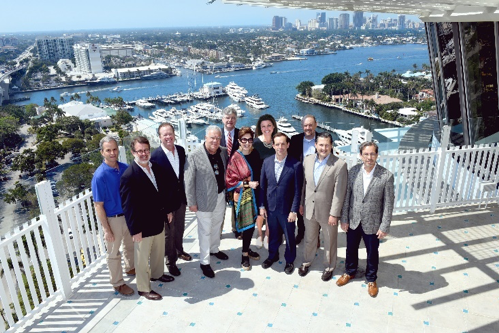 Tavistock Development Company, a diversified real estate firm and owner of Pier Sixty-Six Hotel & Marina in Fort Lauderdale, has announced the acclaimed design team to realize the company’s vision and revitalize the iconic waterfront property. The collective not only brings extensive experience, but an established Florida-presence and understanding of Pier Sixty-Six’s history and place within the fabric of the Fort Lauderdale community. An award winning, architecture and interior design firm, Daroff Design has offices in Philadelphia, New York City and Shanghai. Daroff Design partners with clients to create innovative environments that thoughtfully respond to their strategic branding, cultural, and operational objectives. Projects include Loews Philadelphia, NBC Universal, Comcast Center and MGM National Harbor Spa. HKS Architects, Inc. is a team of more than 1,400 architects, interior designers, urban designers, scientists, artists, anthropologists and other professionals working together across industries and across the globe to create places that delight, heal and enhance the human experience. The award-winning hospitality team, including Principal-in-Charge Matt Clear and Director of Hospitality Sergio Saenz, designs memorable escapes that surprise and please guests in locations ranging from remote seaside resorts to dynamic urban centers. Projects include the Hotel Saint George, W Bellevue, Ritz-Carlton Bachelor Gulch, and the highly anticipated Four Seasons Sao Paulo. Based in West Palm Beach, Garcia Stromberg’s team collectively encompasses architects, interior designers, graphic designers, artists and musicians. Their 25 years of experience, led by Jorge Garcia and Peter Stromberg, has been instrumental in creating successful projects globally. Projects include Boca Beach Club, One Thousand Ocean – Boca Raton, Westin Grand Cayman Seven Mile Beach Resort & Spa. With thoughtful architecture as the foundation for all Phil Kean Design Group’s homes, PKDG specializes in designing distinctive custom luxury products worldwide. Led by the design-build talents of architect and licensed Interior Designer Phil Kean, PKDG features award-winning international architecture and local design/build services. The team has worked on luxury homes worldwide. Based in Fort Lauderdale, Flynn Engineering offers a full range of civil engineering services for all types of development projects in the public and private sectors. Led by Jay Flynn, the firm’s experience includes varied sites, terrains, and regulatory processes throughout the Southeast and Caribbean regions, utilizing its professional staff, computer aided design and drafting system, and advancing technologies to provide timely, cost effective solutions. Projects include Boca Raton Resort and Club, Fort Lauderdale Marriott Harbor Beach Resort & Spa and Lauderdale Yacht Club. EXP is an industry leading hospitality engineering firm and will provide MEP-FP engineering, low voltage, and lighting design services for Pier Sixty-Six. The Hospitality Practice is led by Chris Kearney, Vice President who embraces the challenge of balancing first cost, energy savings, and the environment without compromising the guest experience. Projects include the recently completed Vista Collina Resort in Napa, and over 10 years of history with Tavistock working on Albany and multiple hotel projects at Lake Nona in Orlando. Danielsen Consulting Engineers, Inc. provides professional traffic engineering and transportation planning services to both public and private sector clientele. Led by J. Suzanne Danielsen, P.E. has 33 years of experience and a proven ability to produce high-quality studies while providing relevant and concise presentations to the general public as well as to elected officials. Projects include student housing at Florida International University and the Sagamore Road pedestrian study. Moss & Associates: Based in Fort Lauderdale, Moss brings an honest approach to the construction industry, which helped to create innovative buildings across the U.S. Led by Chad Moss, the firm specializes in construction management, general contracting, design-build and public-private partnerships services across the US. Projects include Soho Beach House, the Fort Lauderdale Brightline Station, Fort Lauderdale-Hollywood International Airport Concourse A, Terminal 1 and Auberge Beach Residences & Spa. Tavistock’s initial site plans focus on restoring and enhancing the existing Pier Sixty-Six Hotel Property to revitalize and preserve the integrity of the current Pier Tower, which will be designated historic. The revitalized Pier Sixty-Six Hotel & Marina will attract guests from across the globe and serve as a social harbor for Fort Lauderdale residents. Visitors seeking a sense of discovery and relaxation will be drawn to the property by its refined amenities and experiences, welcoming accommodations and residences, and thoughtful hospitality. To view project renderings, click HERE. Remember these long-lost South Florida restaurants?